The world today is so unbelievably diverse, yet there are many things that can bring people together. Maybe it is a warm apple pie, a game of cards, or a helping hand, yet each are something that brings people together. A community is a group of diverse people coming together to support, encourage, and grow one another. The community of Broken Arrow is a tightly knit group of people, seeking to promote a lifestyle of generosity and care for one another. One entity within the Broken Arrow community that promotes the wellbeing of the community is the Broken Arrow Police Department. Recently, the Broken Arrow News featured the graduation of our newest K-9 team Officer Michael Ryan and his K-9 partner Thor. Both Officer Ryan and Thor were photographed and given special awards during this defining moment. The Broken Arrow Police Department K-9 unit has a thriving program that trains specially selected dogs to apprehend suspects, recover narcotics, as well as patrol the streets. These dogs are trained for a variety of functions with the main one being the security and maintenance of the Broken Arrow community. As the community continues to grow and thrive, the Police Force remains a staple within the community. For over a year, MicahTek has opened their warehouse space to the Broken Arrow Police Department K-9 unit as a training and certification ground for K-9 teams across the state of Oklahoma. As mentioned in the Broken Arrow News, Thor, the most recent Broken Arrow K-9 graduate of the training program, conducted a portion of his training in the MicahTek warehouse. Countless hours were spent training Thor to differentiate between different types of smells versus a controlled substance. 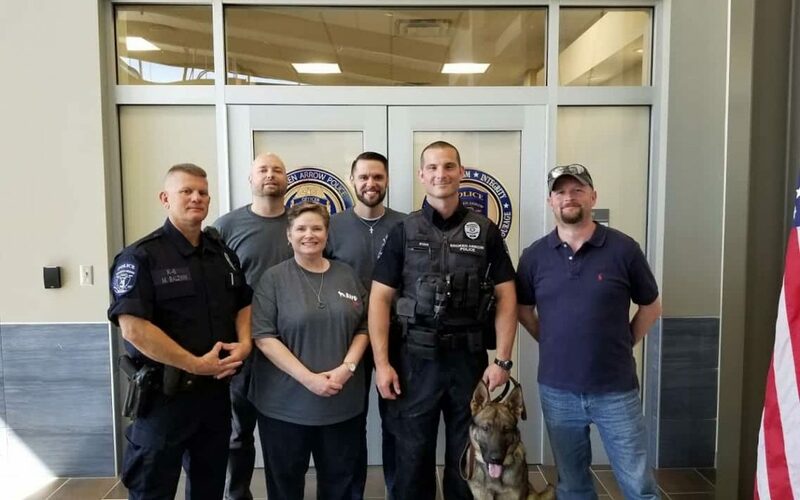 As the K-9 teams were training, there were opportunities for the staff of MicahTek to connect with the dogs and brave Officers who protect Broken Arrow. Catching a glimpse of the rigorous training that the teams endured to protect the community produced a greater respect for the Officers and K-9’s on the force. If it were not for the specialized capabilities of the dogs trained, large amounts of narcotics and precious evidence may never be found. Although keeping the people of the community safe is the main concern of the Police Department, connecting with the people is important as well. Not only do the dogs recover evidence, but they also love showing off their loving personalities and obedience skills at community events and schools. The dogs chosen for the K-9 program are hand-picked for their ability as well as temperament! These dogs are prepared to chase a fleeing suspect or shake paws with a friendly face. Jason Hood, Director of Sales and Marketing at MicahTek, was able to spend some time with Thor as he was being trained. Hood states, “They’re just like any other dog, but when it’s time to work, they’re ready to do their job.” The dogs of the Broken Arrow Police department are fully equipped to help protect the Broken Arrow Community and keep it safe. Community is about coming together to help one another, that is what MicahTek is all about. Our mission at MicahTek is to provide the solutions you need for the growth you desire, this extends past just our regular services. In the end, it is not about being in the Broken Arrow News or being noticed, it is about helping one another to reach our full potential. If you would like to learn more about MicahTek and how we can help your business to thrive, click here or call 918.449.3300 for more information.